Happy Friday and thanks for taking the time to visit the Great Impressions Blog. Another week-end is upon us and the weather is starting to get warmer in our area. So spring is slowly starting to rise. Whoo-hoo!! My hubby has already been out in our gardens getting everything ready. So spring and flowers are definitely on my mind. 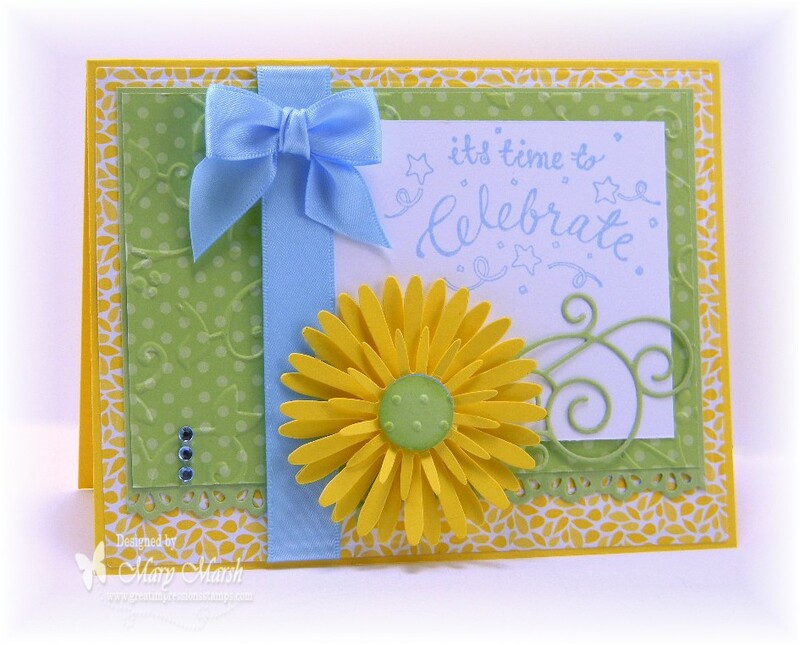 My card for today is using the Great Impressions Stamp "time to celebrate"- E759. This stamp is so versatile and today I decided to go more feminine. Lots of layers and patterned paper on this one. I added a die cut flower, a whimsical flourish die cut, blue satin ribbon and some blue rhinestones. I used an embossing folder on my green background panel and also a border punch. Well that's it for me for this Friday. Remember to stop by this blog on Sunday because we will start our new monthly challenge. I am giving you a little hint on the new challenge theme with the card I made for today (hee-hee). Love how you used your sentiment to celebrate Spring - I never would have thought of that...such a pretty card and that flower really tops it off Mary. Very pretty, love the colors and that flower is fabulous! Thanks for sharing! Mary, what a fabulous card for a celebration. Thanks for sharing.